In modern, digital broadcast environments, the number of video signals is growing dramatically. The video signal is compressed for transmission, and then routed in many different ways as it makes its way to the end user. Maintaining video quality throughout the transmission path depends on the content and path. Hence the distribution and quality control managers must be able to view, control, and monitor many video signals at the same time. To automate the process Video Clarity created RTM – Real Time Quality Monitoring – to measure the degree of quality degradation by comparing the pre- and post- transmitted signals. It has many user configurable alarms and logs anomalies for later analysis. Before getting into the RTM case study, we need to define a few terms used throughout this document. Index – an algorithm that measures quality using the Human Visual or Audio System (HVS/HAS). For this paper, we assume that video quality testing tools, like the ClearView Analysis System, were used to set the processing (compression) units to their optimal levels. Using tools like the above are helpful in determining the desired video quality thresholds. The digital transmission path can fall below acceptable levels and cause a data loss. The effect of the data loss is dependent on the data lost. To understand the errors, we must understand digital transmission and compression in general terms. Digital transforms the analog signal into a series of ‘1’ and ‘0’ and transmits those digital bits over a network. As long as the digital signal makes it from point-to-point, the transmission will be perfect. Unfortunately, digital takes up more bandwidth when compared to analog so compression schemes are used to manage the size of the digital signal. Many video CODECs use a Group of Pictures (GoP) frame structure, which consists of independently coded reference frames (“I” frames), motion changes from the last reference frame (“P” frames) and motion changes from the last or next “I” or “P” frame (“B” frames). As the engineering, operations, or quality manager have you ever been woken up and asked why your signal is off air or recompressed beyond recognition? As a manufacturer have you been told that your equipment fails after 48 hours of continuous use? If you answered yes, you understand the need to continuously monitor your video quality. To this end, Video Clarity created RTM – Real Time Quality Monitoring – to measure the degree of quality degradation by comparing the pre- and post- transmitted signals. A 3RU system, which reads 2 incoming HD video signals, checks for the presence of a signal, aligns the signals in space and time, and continuously applies quantitative metrics to the Audio and Video. It graphs the incoming signal and metric results while logging the quality scores and alerting on configurable events. The system can be controlled through a series of commands sent over an Ethernet socket or via its GUI. In GUI mode, the results are graphed and the logged events are displayed in real-time. The events are configurable such that a degraded signal below the pre-set limit may be set to trigger only if it occurred for X frames out of Y. Events are logged with the corresponding time code, and the failed signals – before and after the error – are saved for further analysis. The bit streams are easily imported into the ClearView Video Analysis systems, which includes Objective, Perceptual, and Subjective testing tools. 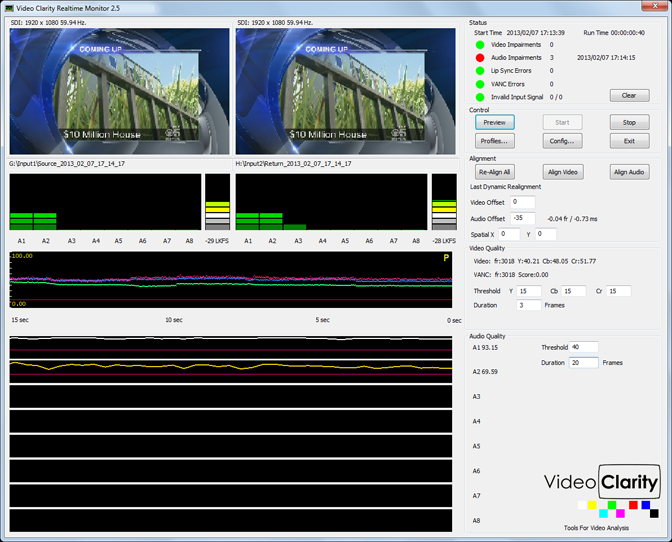 ClearView Video Analysis generates test signals, captures live inputs, and inputs compressed or uncompressed files. It then aligns the audio and video and reports lip-sync issues. It calculates the DMOS, JND, and/or PSNR scores. It uses the Sarnoff algorithm ported to JND (using the VQEG database) and the MS-SSIM algorithm ported to DMOS (using the University of Texas database). It also lets you view the “reference” and “processed” signals side-by-side or their difference maps for your own subjective evaluation. Our Objective, Perceptual and Subjective tools are further discussed on our website at www.videoclarity.com/WhitePapers/.